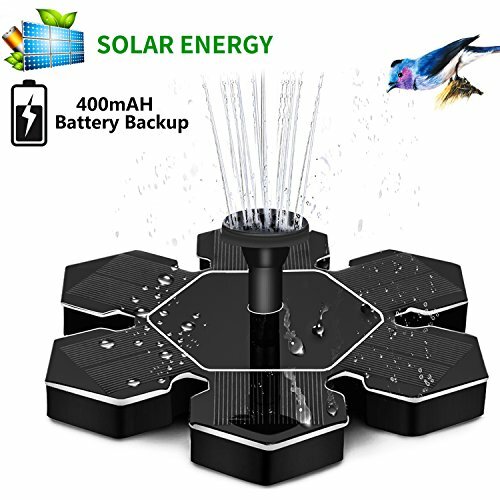 MInuano Solar Fountain Pump, Free Standing 1.5W Bird Bath Fountain Pump for Garden and Patio, Solar Panel Kit Water Pump | Fountain City Art Ctr. which solves the problem that the old solar panels need to be exposed to strong sunlight to make the fountain work and the work is very unstable. 4. Suitable for all occasions. Ex: Suitable for bird baths, fish tanks, small ponds, garden decorations, oxygen water circulation. Under What Circumstances It May Not Work? 2. Solar panel or water inlet are clogged or dirty. 1. Do not leave the fountain in the sun for too long without water. Always keep the pump under the water. 2. Do not use the fountain in dirty or corrosive water. Change the water regularly. 3. Carefully protect the solar panels from damage. [Built-in battery] The upgraded version of the 1.5W solar pump supplies power to built-in battery via DC method, therefore, it acts much stronger and perfectly solves the unstable issues existed in most 1.4W solar panels on the market. [Powerful Solar Panels] Pumps work well even when solar panel blocked by clouds or birds. Ps: The old 1.4W solar panels need to be exposed to strong sunlight to make the pump work, it is unstable. [7 Nozzles For Different Spray Pattern] Totally 7 nozzles includedfor a great variety of spray patterns, designed to create a variety of spray types while saving water in the meantime. [Multi-Purpose] Suitable for bird baths, fish tanks, small ponds, swimming pools, garden decorations, oxygen water circulation. Make your garden beautiful and charming. [Simple & Quick to Start] Just put the fountain pump on the water, and after the solar panel gets enough power, it will start in 3 seconds. If you have any questions about this product by MInuano, contact us by completing and submitting the form below. If you are looking for a specif part number, please include it with your message.